I still remember creating Halloween costumes as a child with my dad, back in my small hometown. Hearing people say “How did you make that”?? or “Where did you come up with that idea?” created a passion to continue building costumes throughout my adult years. October always creates an inner excitement of what is about to come, “wowing” people for another year. At the 2011, San Diego Monster Bash, I did just that. I was turning heads and amazing people with the illusion I was a genie riding a magic carpet, coming out of a lantern from a puff of smoke and at the same time levitating in the air. Creating a costume always begins with thinking of a creative concept, something that hasn’t or can’t possibly be done. Usually I grab a pen and paper to start a rough draft. I typically have two or three top ideas running through my mind over the past several months, actually November 1st the previous year. I ordered some basic supplies online such as the carpet, lamp, and LED lights. A local Halloween store, hardware and craft shop provided the props for the rest of the costume. The base or platform was made of cardboard criss-crossed with two old hockey sticks. I cut a section out of the back third to stand through and attached cables around the hockey sticks to hold up the costume. These cables were then attached via carabiners to a utility belt in a tripod arrangement. The carpet and platform were supported by the cables and suspended around my waist. I did not want to have a support structure to the ground with a cart because I wanted to give the illusion of levitating by simply bending my knees and walking. After the cables were attached I then attached the carpet to the top and bolted the lamp to the top. The smoke was made from chicken wire molded to a basic smoke shape, arranged with LED lights and finally cotton was placed around the mold, secured with fishing line. 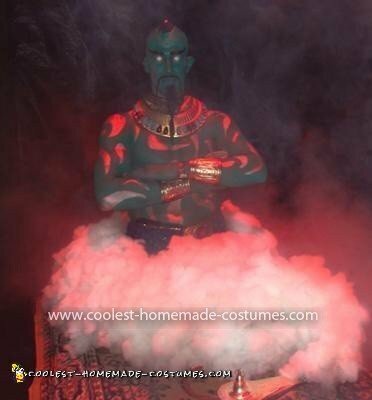 The bottom half of the Genie was made with wizard pattern fabric from a linen store. 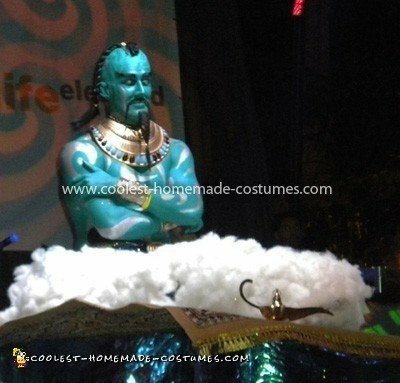 The wrist bands and chest piece were props for a Cleopatra costume colored with permanent markers. The prosthetics and make-up are the final stages and key to making the costume realistic. I spent approximately three hours putting on the make-up and another two hours taking it off. The blue body paint was harder to come off than I thought. The total cost of the costume was around $150.00 not including the white contact lenses. I love this! You are so creative and talented! I know exactly what you mean about the October excitement. I love the leprechaun costume too! You are my new inspiration!!! every year when the time comes sometimes I say to myself “where are all the cool homemade costumes”??? thank you for keeping that alive!!!! By far the costume of the century. I can’t believe the detail. All I can say is WOW. Do you have any other costumes?? Great job. Looks real. If only I could make three wishes, I would use one wish to see your costume live. Thanks for making Halloween awesome. Were did u get the carpet from? Excellent costume….the concept and the delivery. Love illusion costumes and transformation concepts. Good job! One of the best that I have seen—would be a prize winner in Philadelphia at the big halloween ball by Henri David. GOOD JOB! i love that costume! i absoulutley love the idea of an optical illusion! i might do something like that for my kid! keep up the hard work! 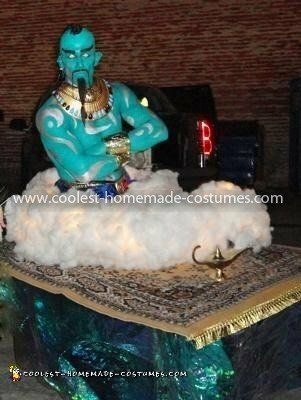 Your genie costume is uber amazing!! I love this!!! My family thinks I am nuts with my obsession to pull off a fantastic halloween costume! I am happy i am not the only one out there. i love seeing the faces in my small town when we walk into the annual costume contest. every year I feel the need to outdo the last! I did this a few years back. it took 2nd prize.$500. your make up and paint is by far better then mine was. i did add a little illusion of floating by wearing roller blades to get across the stage for judging. good job. 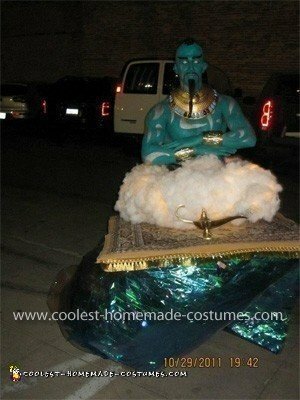 This is by far THE BEST costume I ever seen = CONGRADULATION!! May I ask how long you’ve been working out? Amazing costumes!! Amazing effort!! You need to take your costume to Wellington, New Zealand for the biggest dress up party in the Southern hemisphere (based around a rugby tournament). Prize pool for costumes is $50k. You’d be up for the supreme winner (NZD$10k) with a costume like that!